Okay... there are way too many dance titles out for Kinect! How can a gamer keep up, especially one who likes to dance? Thankfully you have your good ones, your bad ones and your average ones which will make your selection a hell of a lot easier. With that said, Dance Paradise borders on the average dance game and boasts cutesy graphics, the ability to use your XBox 360 avatars and a learning curve that goes from super easy to super difficult. If you have issues with your coordination, than I suggest you look elsewhere for your dancing fun! Get ready for the Ultimate Dance Party! Official Partner -Universal Music the #1 music house! 40 big dance hits & original video clips! 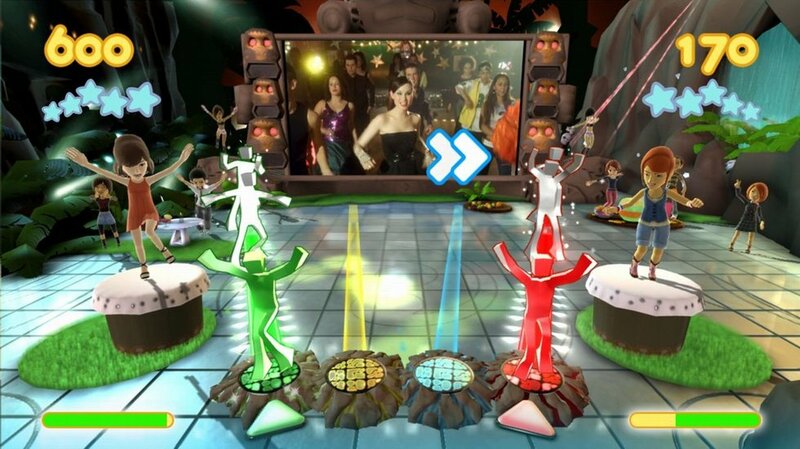 Become the Queen/King of the dance floor by reproducing some of the grooviest moves. Have your score listed via the live Scoreboard. Earn rewards to unlock new outfits and accessories for your avatar. Solo or multiplayer modes (off & online). 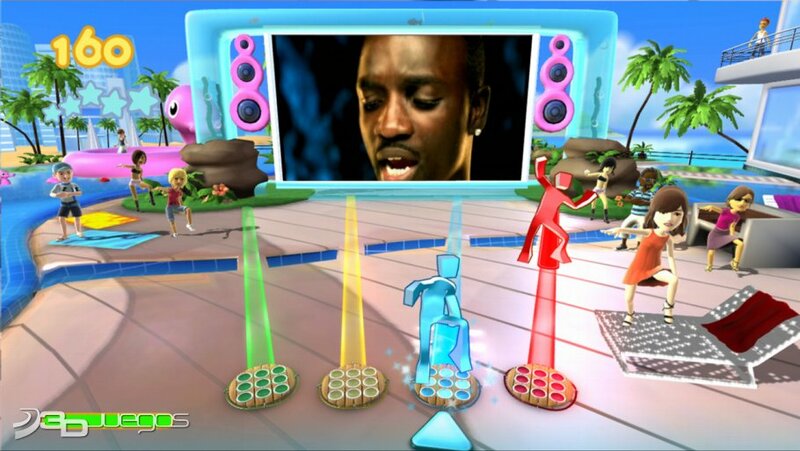 Dance Paradise is a strange game as it incorporates an almost Guitar Hero type interface to your "dancing". As opposed to notes sliding down the four coloured (green, yellow blue & red) lines, these notes are actually dance moves and the goal is simple. Mimic the dance moves. Unfortunately these dance moves are quite simplistic at the best of times which doesn't get your body moving that much. However all of a sudden, the difficulty rises sharply and mimicking those faceless dancers does become a chore. 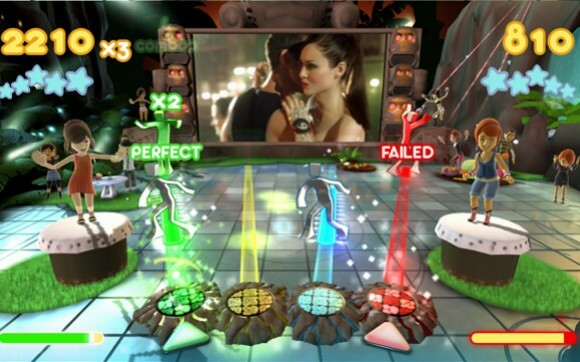 In terms of gameplay, there are 7 modes of play that includes an interesting career mode in Dance Paradise which allows you to make your way up the ranks of the dancing world. Then you have "Free Play", my favourite which does allow you to go a little crazy as opposed to the Guitar Hero style of gaming. Even though it may not be the most challenging game on the Kinect at the moment, the developers have ensured that the accuracy is up there with Kinect Sports and Kinectimals but unfortunately the dancing of this game needs to be refined a little better. The game does support multiplayer that include a versus mode, co-operative mode and an attack mode (remember Guitar Hero versus?). Attack mode is actually kind of fun which allows you to use power-ups to sabotage your opponent via nefarious dance manoeuvres. For example, I can "freeze" my opponent which does makes things quite difficult for them. All in all, multiplayer is considerably better than single-player. Graphically, the title is a little lacking, especially that polished professional look. It doesn't look bad but it looks more Wii than 360. The music videos that play in the background are decent enough but the star of Dance Paradise are the plethora of bopping musical tracks, 40 to be precise. These tracks include some modern classics from Lady Gaga and a variety of other awesome singers, bands and rockers. Not bad for a relative B-grade game. In the end, Dance Paradise is a weird game as the dancing is quite limited and easy at the start but suddenly skyrockets to a whole new level. If you don't have rhythm or the ability to shake your booty, Dance Paradise will be a frustrating experience but for the seasoned dancers, this is one game that may just grow on you!